Our roots run deep-deep in the heart of Texas. We’re a family-owned and family-operated company that believes in getting the job done right the first time—every time. We first set up camp as Accu-Air Air Conditioning & Heating and are now blazing a new trail as Texas Air Authorities in order to protect and serve the comfort of even more citizens in this great state of Texas. We’re committed to protecting and serving the heating, cooling and indoor air quality needs of residential and commercial customers. We keep a fully stocked arsenal of quality products and superior services to conquer the bad guys that threaten your indoor comfort. We’ll track down the culprits and throw them in the stockade—for good. There isn’t an indoor comfort threat we haven’t faced—and wiped out. We use our HVAC smarts and leave no stone unturned to solve your case. At Texas Air Authorities, you’re not just a customer. You’re a member of our posse. So we want to do right by you—every time. That’s why we created our 5-Star Service Guarantee. The members of our team have taken an oath to be: On Time, Clean, Honest, Fair and Professional. Those aren’t just words. They’re our way of doing business. We swear. We’ll Safeguard Your Budget, Too! We also understand that our customers sometimes face financial challenges. At Texas Air Authorities, we believe in doing everything within our power to make your dealings with us not only satisfactory but also affordable. That’s why we offer high-caliber maintenance agreements, budget-friendly financing and powerful coupons and special offers. You’ll know us when you see us. We wear uniforms—further evidence of our professional approach, commitment to cleanliness and dedication to the safety of you and your property. We pride ourselves in being the fastest draw in the West—not to mention the most accurate at repairing, replacing and installing HVAC systems and improving your air quality. You can rely on us to be professional, experienced, friendly and affordable. When it comes to meeting your heating and cooling needs, there’s a new sheriff in town: Texas Air Authorities, Inc.
We know these parts like the back of our hand. 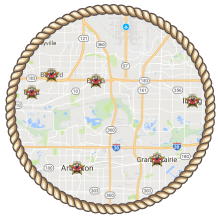 From Arlington to Grand Prairie to Mansfield and beyond, we’ll meet you anywhere, anytime to bring your outlaw HVAC system to justice and restore your comfort.